The United States Mint published today its product page for the upcoming 2018-S Silver Reverse Proof Set. It offers no new information in the sense that the agency already announced details such as the set’s $54.95 price and 200,000 product limit, but it does — for the first time — give collectors a look at the set with several included images. 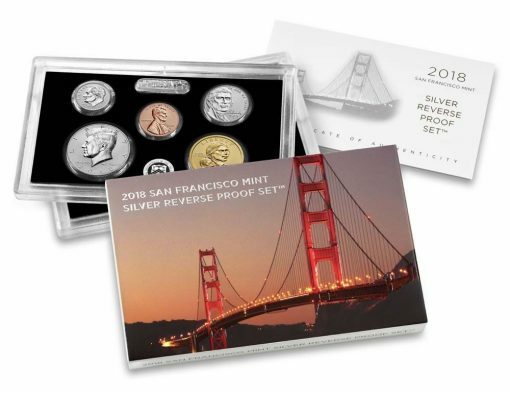 Produced to celebrate the 50th anniversary of regular proof coins from the U.S. Mint in San Francisco, the 10-coin set of reverse proofs will launch on July 23 at noon EDT. Buyers will be limited to 10 sets during the first 24 hours of sale. The sales restriction will be lifted after that time. Unlike standard proofs that have frosted designs against mirror-like fields, coins in the set will feature mirrored designs against frosted fields. 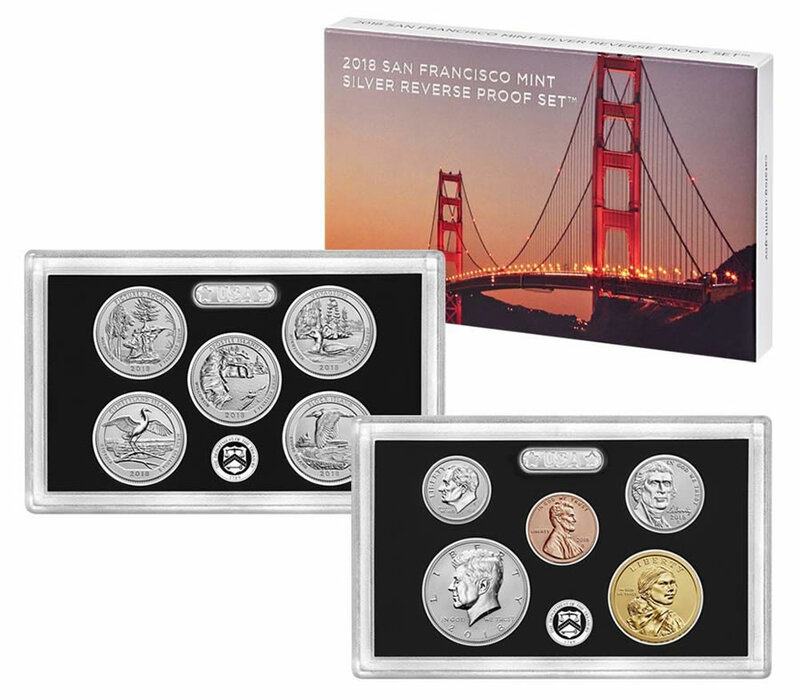 Each coin will bear the San Francisco Mint’s "S" mintmark. Seven of the coins will be struck in .900 fine silver, including the half dollar, the five quarters and the dime. The cent, nickel and $1 coin will be struck in their regular compositions. Visit the U.S. Mint’s product page for the set right here. Spot silver closed under $16 yesterday. Lower your silver coin prices U.S. Mint Director Ryder! (Instead of raising them this year as happened). These are already listed on Ebay!!! I also think if the mintage was 100,000, it might make it more desirable. Just my humble opinion. The mint goes from one extreme to another. Over the past few years they issued very popular sets, but with excessively low mintages. This makes collectors angry because they can not get in fast enough to get them for their collections. And now they issue nice sets with too high of a mintage. So most collectors now shy away from them. You would think the mint would learn a valuable lesson. A lot more collectors will not purchase as much from the mint. I think we can all see this happening now. Just my opinion. And with silver spot as low as it is, The sets are overpriced. Thank you, Mike, for your insight. As for me, since I don’t buy nearly as frequently from the Mint as I used to, I have no issues with the price for this nice set. Christopher -This does look like a nice set, and since it is a reverse proof – It does make it a desirable set. I just think it is just a little overpriced. A beautiful set though. And I agree with you, the max. mintage should have been 100,000. I’ve got 40 or so sets of those stupid 225th enhanced uncirculated sets taking up room in the safe. No increase in value, even though they were half the cost. At the time they were near impossible to get hands on … but have proven to be a dog of an investment. I think I’ll wait, and bundle with the San Francisco silver eagle to save on postage. I’m predicting the reverse proof sets will still be available a month after release. Is this really the best the Mint can do for a 50 year set? Reverse proof sets were very nice and desirable when they were first produced but it has ran it’s course. The mint needs to step up their game considering we have basically seen the same coins and sets with a different dates for the last 8-10 years or so. Okay, I’m done venting. Well not quite, with soot being around $16 this set is way overpriced. I will be getting a couple of sets! Never been done before. Right? the coins in the Silver Proof Set should be all silver except the penny which should be all copper. Need to get rid that cheap manganese and zinc, not even worth owning no matter how much they’re polished. 110% agree. It’s like having a diamond ring set in tin. Sets would be so much nicer if they paid the extra couple dollars in materials. i will buy this set on e bay a year from now for 45 dollars. I will buy this set from you in a year for $40, which is what it should be priced at with spot silver going under $16 a few times during last week & down a lot this year! Seth – Are you going to buy a set or two anyway, in spite of it being over-priced? I value your opinion. Do you think it will sell out? woof woof…..just sayng the pic are awful looks like a blasted burnished unc…..@ best….. These are NOT actual photos….these are computer generated graphic illustrations. I wish the US Mint would start to use actual images of coins and medals….these illustrations are lame. Spot pricing for commodities (silver included) are for prices to be paid 3 months from now in the futures market. It would be difficult to determine the exact price that was paid by the US mint for blanks used in current year mintage (unless the the price/invoice is made public). Yeah, $40.00 on e bay next year, and five years from now if I sold to my local coin dealer I might get $20.00 tops. The 2014 rev proof kennedy sells for $50. It had mintage of 225k. One coin should pay for most of this set. PS, there aren’t a lot for sale. People who bought them hold them and anyone with the first will want the second. That’s just one coin in this set. I personally am after the dime because I have the other one. This set will be EXTREMELY desired. They have one from W. This next one from S. Anyone want to bet the next one id from P? The dimes are from P and S. Bet the next one is from W.
PPS and lastly.Every time a new one comes out the demand for the older ones will increase as those who missed them will become aware of them and want them for set. Whats the point in owning coins that look the same as pocket change. Who cares if this are proof , reverse proof etc. At the end of the morning its still just worth face value. Whats the point in having this coins in your drawer? To look at them on a sad day or something. I have older coins saved up like morgan dollars etc, and even those coins i question my self, what em i doing, whats the point of having this coins. I personally like the history and artistry of coins. If your collection brings you no enjoyment you should sell it, IMO. Yes, I will be buying 2 sets since I have all the previous reverse Proof coins offered by the Mint since the first coin in 2006. It is a little overpriced, but people love silver & reverse Proof coin collectors will need a set for their collection. I don’t have any idea if 200,000 sets will sell out fast or not. But, it is worth it to at least get one set IMHO. I got an email from MCM on Friday offering a pre-sale for this set. I went to their website today, Sat. 7/21, and they are SOLD OUT! I don’t know how many sets they were offering to sell so it really doesn’t mean much except that their customers probably think they didn’t have much of a chance to get this set from the mint. Or that’s my thought on it. Right or wrong? Where is the S mint mark located on the Sacagewa dollar? Thank you. These are THE WORSE PROOFS EVER. On one set EVERY quarter looked like it was scraped on the ground. Never seen anything like it. On one of the Kennedys it looks like he has a beard the scuffing is so bad. I think someone might buy this BECAUSE they are so poorly minted. STAY AWAY FROM THIS PROOF. The worse I have ever seen on a consistant basis. Lovely to look at, nice to hold, but I still sent them back, the lenses looked old. Ordered two sets…returned both sets. There were odd shaped bubbles, measuring from 1/2 to 3/4 inch under the lenses on both sets, and a pronounced rim ding on both cents (obverse at 3 o’clock). Appears that quality control remains an issue with our beloved US Mint.